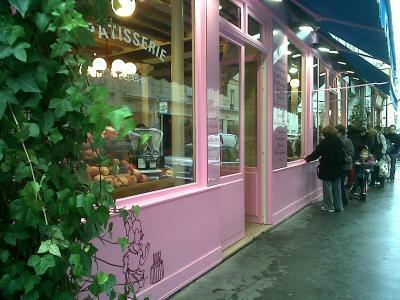 A boulangerie can be found on almost every block in Paris. One in particular sets the bar very high--Stephane Secco in the 7th Arrondissement. Secco—sometimes referred to as the pink bakery for its brightly painted storefront—offers freshly baked breads, desserts, pizza, quiches, salads, and sandwiches. This classic Parisian bakery has it all—a beautiful space, delicious offerings, and a friendly staff. Just a warning: You will find yourself coming back for more to try Secco's oversized macarons, a pain au lait, and a raspberry tart. If you stop by to pick-up lunch, try the poppy seed baguette with mozzarella, fresh basil, and tomato (about 4 Euros) or the Niçoise salad (About 6 Euros). All salads include Secco's divine bread of the day. It's so refreshing to experience a city where bread is considered an essential part of the diet. Merci, Paris. Secco is located at 20, Rue Jean-Nicot in the 7th Arrondissement. Closed on Monday. Metro: Line 8; La Tour Maubourg or École Militaire. Sandwiches and pastries start at 4 Euros and salads from 6 Euros. A croissant or brioche costs 3 Euros each. Tips: Pick up a couple of sandwiches and pastries and have lunch along the Seine (only a few blocks away) or have a picnic at the Invalides. There is a line at lunchtime, but the wait is worth it. Trust me! A million thanks for pstonig this information.